Selectric, a range of competitively priced electrical wiring accessories, have a square edged profile. They include in the range accessories like twin sockets, triple pole fan siolators, sockets with USB, 45a accessories for the kitchen and bathroom. 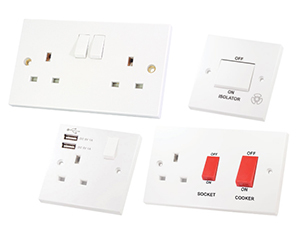 Why not take a look; Selectric Wiring Accessories.